Do you think the surface markings on Venus resemble somewhat those on Europa? Re: Does Venus Resemble Europa? I would say that all the planets resemble each other to some extent, since they all experienced catacylsmic plasma phenomena sometime in the recent past. 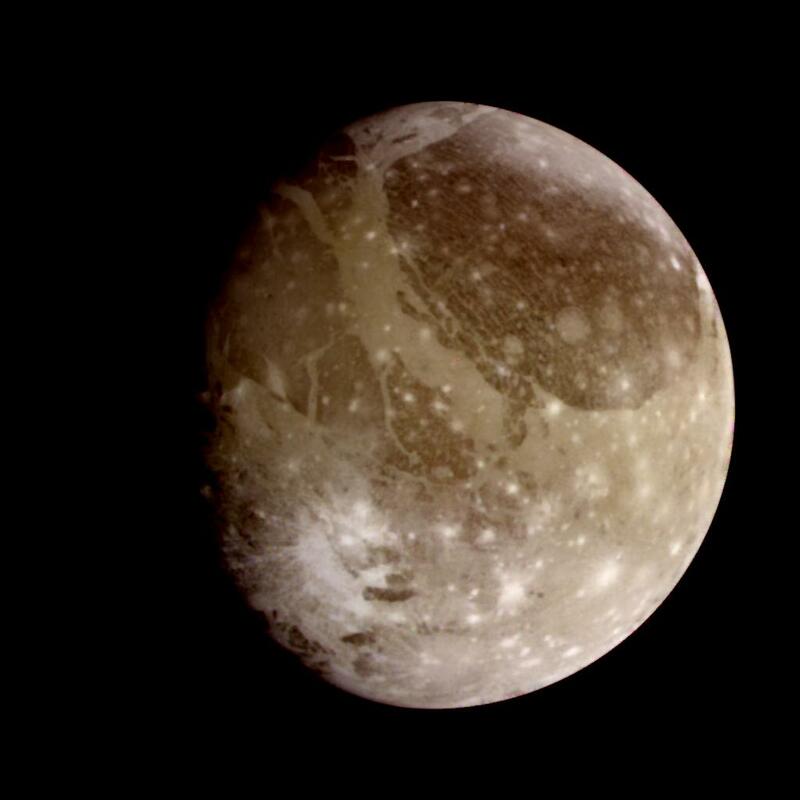 Ganymede is a good example (as a moon larger than Mercury with a magnetic field, it is more like a planet) of those scarring effects, as is Europa. Ariel, Miranda, Triton, Callisto, Rhea, Enceladus, etc. also exhibit formations that look like welding seams, plasma torch channels, uplifted fulgamites, cathode whiskers, braided swaths, etc. In response to a rather inane article on CO2 causing Venusian warming, two posters (one being me!) have posted links and content to the Thunderbolts site. That was a really great discussion with a lot of lively responses. I liked how no one there could readily disprove EU so most just acted as though the subject had not been raised. That to me speaks volumes on just how valid the EU theory must be. I've read too many discussions over the years and visited many alternative science sites so if this theory was based on quack science that group would have jumped on it and picked it apart. I hope I don't offend anyone by calling it a theory I just find it prudent to refer to all matters dealing with the Universe a theory given our meager and fairly recent status as a space faring species. It by no means is undercutting the science behind it I just like to leave room for future refinement. After reading all the comments on the Venus discussion I feel like I've taken a crash course on the composition of Earth's and Venus's atmospheres. Basically it boils down to....Earth good......Venus bad. I did have a problem with Anna the super scientist though and felt compelled to let her know. In retrospect I probably should have let it go but her actions to me are the epitome of all that is wrong with most of the scientific community. By the way. I'm new here. I was sold within 5mins of reading the first page on the main site. Everyone around here seems exceptional at being able to NOT limit themselves to mainstream academia. I myself am a high school drop out who barely made it 3 months into my freshman year. While I might not be able to convey my thoughts as eloquently as some of you I can assure you your thoughts will not be lost on me. Great site folks it's a real pleasure to be here. No offense taken. All things science tend to be theories until disproved. Even long-held beliefs are simply theories which could potentially be falsified if the right data comes along (assuming the scientists are willing to critically examine their models and declare them falsified when applicable; granted it's difficult to give up an idea, but necessary to science). Gravitation-only cosmology should have crumbled long ago with Zwicky, Rubin, et al. But instead they invented new hypothetical epicycles (dark matter) to explain away the failure of the gravitational model to account for gross galactic structure and motions. Now that fairy dust gets sprinkled everywhere. But, I digress and will leave it at that. Well, a colleague accidentally sent me off on an internet dumpster diving expedition. Off-hand comments sometimes do that to me. You look up one thing, go "hey, wait a minute!" and then have to look up 5-10 other things. So, someone asked a question about whether the double-eyed storm on Venus had any corollary at the poles of Earth. I vaguely recalled mention that in fact "once in a while" sometime similar might crop up but disappear relatively quickly. A rare / transient effect. But, in looking for the article (I never did find it), I happened across something a bit more peculiar and interesting. 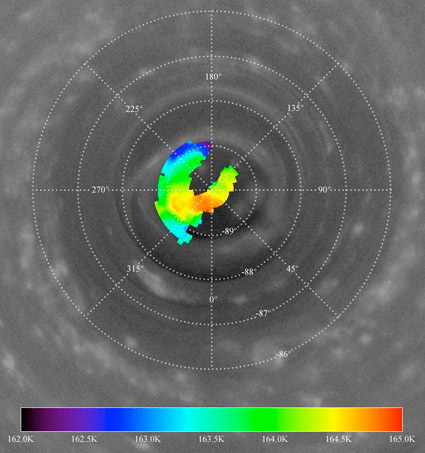 The relationship between the fine structure of Venus's double-eyed polar vortices and the structure of the eye of a hurricane. It seems that the eye of a Hurricane can form a pattern not unlike the Venusian double-eyed vortices' fine structure and that of sigmoids on the sun. The latter (sigmoids) is has now been surmised are electrical in nature, composed of filaments and ribbons / sheets of electric current. Likely (in my opinion), so is Venus' structure. Tentatively, so may be Saturn's polar structure (preliminary CIRS data cites by Wal Thornhill seems indicative, though not yet conclusive). And VERY TENTATIVELY Hurricanes on Earth may have an again similar structure to the aforementioned. Now, the meteorological explanation seems to frequently use the term "Barotropic Instability" to explain the duality in a Hurricane's eye. Thus they want to apply that model to Venus. I'm not sure that's a correct assessment. Maybe so, maybe not. Anyway, I decided to dig further... So, I Googled "barotropic instability" and hurricanes. While it didn't quite net me the cache of information I was hoping for, I did run across another interesting article on hurricanes (since it mentioned the barotropic instability). This item was about Hurricane Isabel. In particular I was interested in figures 2 & 3 (3 being a computer model version of 2, nearest I can figure). What it shows is the eyewall of the hurricane incorporating 8 vortices, which consolidate down into 4 vortices. For a minute it looked very familiar but I couldn't quite place it (well, I placed it since it was quite familiar, I just couldn't remember the name of it). Then as I was paging through Wal's site (before I found it), I recalled the plasma instability called a "diocotron instability." Then it kind of seems like things fell into place (for me anyway). If anyone recalls, Wal explained Saturn's central polar hot spot (inside the larger polar vortex) as interacting Birkeland currents (field-aligned currents). 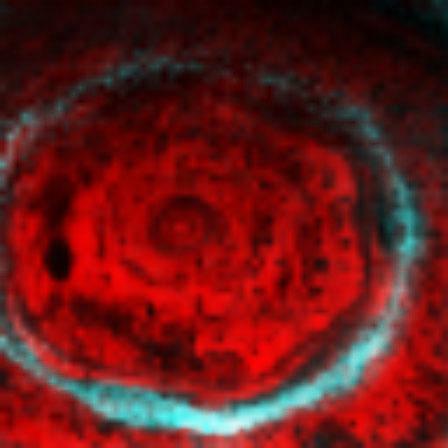 Wal Thornhill wrote: The image [of Saturn's polar hot spot in IR], while being incomplete, supports the electrical model. At around 300˚ we see the yellow-reddish cusp feature of one Birkeland filament. At intervals, heated gas from that filament is 'squirted' in a thin jet into the central 'sump,' indicated by the reddish patch over the pole. The inward jets alternate between the two filaments so we may expect the pattern to be repeated where the infrared data is missing. Birkeland current filamentation can be seen best in the top quadrants of Saturn's blue auroral ring. The cylindrical auroral beam is subject to vortex formation, known as 'diocotron instabilities.' Historically, vortex structure and vortex interactions in charged particle beams have been known since the turn of the 19th century when Kristian Birkeland first photographed the passage of particle beams through low vacuum in his terrella cathode experiments. Neighbouring vortices are subject to long-range attractive and short-range repulsive forces, which result in a departure of the discharge pattern from a circle to a polygon. The diocotron instabilities in the inner current cylinder are forcing the cloud pattern to form the distinctive hexagonal shape. The polar hot spot is heated by the Birkeland current discharge in the core of the Z-pinch. So, it seems like at Saturn we've [probably, assuming Wal is correct] got the case of a central sigmoidal (s-shaped) feature caused by interacting current filaments and a circumpolar hexagon caused by a diocotron instability. One is tempted to point out that extremely strong electric fields were detected over the so-called "electric hurricanes" of 2005. Apparently the lightning was "mysterious" to researchers as well (hurricanes apparently rarely have lightning?). Initially packing winds of 90 miles per hour, Nargis caught forecasters by surprise when it suddenly intensified until winds reached 130 miles per hour just hours before landfall on May 2. New research is suggesting forecasters could have seen the danger coming, if only they had been watching the storm's lightning patterns carefully. a team of researchers found that with Nargis, large spikes in lightning activity occurred near the eye wall 36 hours before its deadly intensification. So, apparently there's some strong correlation between heightened electrical activity and heightened physical wind speed, with approximately a day and a half lag time between. The specific mechanism / relationship isn't yet known. So, it seems like there's some distinctly electrical factor that's not yet being included in forecasters & modelers simulations. And, Did I Forget to Mention "Hot Towers"? Yeah, Them Too! So, as I was looking further into hurricanes and barotropic instabilities I apparently fell even further down the rabbit hole and stumbled across yet another odd feature of hurricanes called "Hot Towers." Kelley and Stout define a "hot tower" as a rain cloud that reaches at least to the top of the troposphere, the lowest layer of the atmosphere. It extends approximately nine miles (14.5 km) high in the tropics. These towers are called "hot" because they rise to such altitude due to the large amount of latent heat. Water vapor releases this latent heat as it condenses into liquid. A particularly tall hot tower rose above Hurricane Bonnie in August 1998, as the storm intensified a few days before striking North Carolina. Bonnie caused more than $1 billion damage and three deaths, according to the National Oceanic and Atmospheric Administration National Hurricane Center. After compiling the statistics, Kelley and Stout found a tropical cyclone with a hot tower in its eyewall was twice as likely to intensify within the next six hours than a cyclone that lacked a tower. The "eyewall" is the ring of clouds around a cyclone's central eye. Kelley and Stout considered many alternative definitions for hot towers before concluding the nine-mile height threshold was statistically significant. By looking at how high up the rain is forming within clouds, scientists can estimate whether the hurricane's surface winds will strengthen or weaken. They have found that if rain is falling from clouds that extend up to 9 miles high, and that rain continues for at least one out of three hours, a hurricane's surface winds are likely going to get stronger. Hot towers are one window into the mystery of how hurricanes grow stronger. A single hot tower does not tell you much about a hurricane, but a rapid sequence of towers suggests that something unusual is going on deep inside the hurricane. By combining measurements from many hurricanes, statistics show that if hot towers exist in the eyewall at least 33% of the time during a three-hour period, a hurricane's destructive surface winds have an 82% chance of intensifying. Otherwise, the chance of wind intensification drops to only 17%. The bottom line is that if several hot towers are present in a hurricane over a period of time, there's a higher probability of a storm intensifying. Kelley is still searching for a more complete explanation of what causes these bursts of hot towers. Radar observations have shown conclusively that these bursts happen, but further research is needed to explain why and how. I like your thinking. I have been thinking about low pressure systems and their ability to raise the surface of the ocean by a few feet. Fluctuations in air pressure are caused by the deformation of the troposphere, which also causes winds. I believe hurricanes, tornadoes and lightning are simply "charge equalisation events" and the hot tower within the hurricane is the flow of charge, could be why hurricanes die quickly when they encounter land. I'm wondering if the fluctuations in sea level are caused by the Earth's magnetic field deforming rather than changes in air pressure or the passage of the moon. 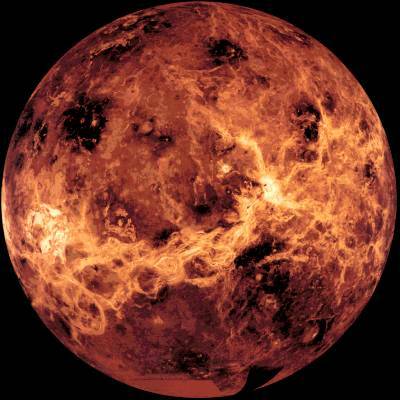 What's with Venus' "White Spot"? Too specific to be a storm system, too big for a volcano. Any EU topics I need to read up on to understand this please? Re: What's with Venus' "White Spot"? Wow my prediction came true! I predicted that the so-called 'experts' would be puzzled! This could be a reaction of our whole Solar System. Last edited by nick c on Wed Mar 23, 2011 4:20 pm, edited 1 time in total.